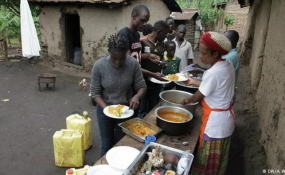 A group of vegans in the Nairobi area of Majengo regularly meet to prepare and eat lunch together (file photo). Vegans eat a diet that is entirely plant based, eskewing the traditional eggs and milk of traditional vegetarianism. "It's entering the mainstream," said Rich Hardy, head of campaigns at Veganuary. "It's doing something not just for yourself but also for animals and the planet as well." Livestock farming is a major driver of greenhouse gas emissions, consumes a 10th of the world's fresh water and causes large-scale deforestation. Meanwhile people in the United States and many European countries eat more than double the recommended levels of meat for healthy diets, according to a report which also said cutting animal products from diets would be a "relatively easy and cheap way" to tackle climate change. Much of the growth in vegan food sales was driven by "flexitarian" eaters, who are looking to reduce their consumption of animal products instead of committing to a solely plant-based diet, said Mintel. "There has just been such a buzz around meat-free foods, and that wasn't there before," said Emma Clifford, the firm's associate director of food and drink. "The meat-free market was in decline for ages and now it's picked up and we do think it's going to grow a lot more." Almost half of those taking part in Veganuary were previously meat-eaters, according to data collected from those signing up, and organisers said nearly two thirds were expected to remain vegan once the month was over. "Most people do recognise we need to eat more plants and fewer animal products, so I think there is more awareness," said Dominika Piasecka, a spokesman for Britain's The Vegan Society. "Also there's just the convenience of getting vegan food these days: it's really easy to go to a supermarket and pick something up, whereas in the past we may not have had so many substitutes." The growth in veganism has not been without controversy - global office-sharing company WeWork prompted debate in 2018 after announcing it would no longer serve meat at company events or reimburse expense claims for meat.